DIY Christmas Cheese Board | Easy Holiday Cheese Board Ideas! DIY Christmas Cheese Board | Easy Holiday Cheese Board Ideas! 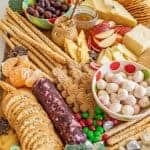 How to make a DIY Christmas Cheese board for a party complete with what cheese to buy, how to make it festive, and more! Place your cheeses on your board. Feel free to pre-slice one or two of the cheeses if you desire. Place condiments (jam and mustard) in small serving bowls (bonus points if the dishes are festive!) and place on board. Place crackers etc. around the cheeses. Garnish with candies and small seasonal items. Find Christmas shaped treats and shapes like gingerbread men, trees, stars, and candy canes to make this board festive. The little trees that aren’t cookies on my board are actually cheese crackers!